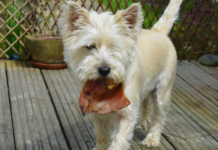 Does Your Dog Need Hypoallergenic Food? Some people have dogs but are completely unaware of the fact that even dogs can develop allergies, and especially the food allergies. Perhaps the best solution for this would be visiting your vet and then letting him to various tests in order to determine to which foods your dog is allergic to. An elimination diet will probably have to be attempted, but there are other things a veterinarian could do to figure out to which foods your dog is allergic to. It is always considered to be unwise to just guess what the food your dog is allergic to is, because there is a good chance that your dog is actually suffering from something a lot more dangerous, and you could never tell. Due to the fact that there really isn’t any simple test that is immediately going to show you to which foods your dog is allergic to, you as a dog owner are probably going to have to do a lot of grunt work in order to figure that out. You will need to try out different various diets and experiment with them as well as with the dog food formulas. However, if this has led you to think that this is something dreadful, there is no need to panic, because it is not. With the help of this guide, you’ll be able to figure out what is it you ought to do, and besides that, we will also give you a list of the five top hypoallergenic foods for your dog, and all you have to do is pick the one you like best. The very second you pick it, you could buy it and start administering it to your dog because it could completely change the bad way he’s been looking and feeling. So, if you do have a dog that doesn’t really feel or look the best, you should try a hypoallergenic dog food, and then see if it’s making any results and also figure out what’s been causing the symptoms. Keep in mind that pinpointing the allergies is a very difficult task, even with a veterinarian around, and that is exactly why you ought to get some hypoallergenic dog food and help make this task a bit easier. If you’ve ever encountered terms like dog allergies or intolerance to food, you may have encountered hypoallergenic dog food as well, but actually, not many people really know what this term applies to. Of course, most people know what allergies are; it’s a negative response of our immune system to some kind of food allergen. And when your dog encounters and eats a food allergen, a bad reaction is going to follow. Also, there is the intolerance as well, but this term does not involve the dog’s immune system. When it comes to dogs and their allergies, they are usually attributed to some proteins that can be found in food that come from either an animal or plant source (see these vegan plant-based dog biscuits). The dog’s body then breaks down these proteins and misinterprets them as something unfriendly. The most common of these allergies include chicken allergy, beef allergy, wheat allergy, soy allergy, and an allergy to dairy products. It is really important to know that some of these allergies don’t develop immediately, but over a longer period of time, and that is why it’s possible that your dog has been eating a certain type of food for a while with nothing happening to him, and then, all of a sudden, an allergy to that food appears. But, things become even more complicated than that, because the symptoms of food allergies are not the same in humans and animals, or more precisely, in dogs. This might be a bit tricky to understand, so let’s explain it through an example: a person that’s allergic to shrimp would usually develop a swollen throat, while a dog allergic to the very same food would develop itchy skin. Limited ingredient dog food can help out much because so many of the ingredients can just be eliminated, which would allow you to pinpoint what is it exactly that your dog’s allergic to. Novel ingredient dog food contains some of the ingredients that you have never before probably given to your dog, meaning that it’s something new to him. This includes kangaroo meat or ostrich meat. Due to the fact that your dog has never eaten this kind of meat before, the chances are that he won’t be allergic to it. Prescription or veterinary diet is exactly what its name says – food with nothing but the hypoallergenic ingredients that are being recommended and prescribed by a vet. However, there is one downside to this diet, and it includes the fact that these kinds of food can be really expensive. Many people ask this question, but it’s not really up to them to decide if their dog needs any hypoallergenic food; that is something that the veterinarian ought to decide. If you have a dog that is allergic to some kind of food, then he certainly needs hypoallergenic food for dogs. 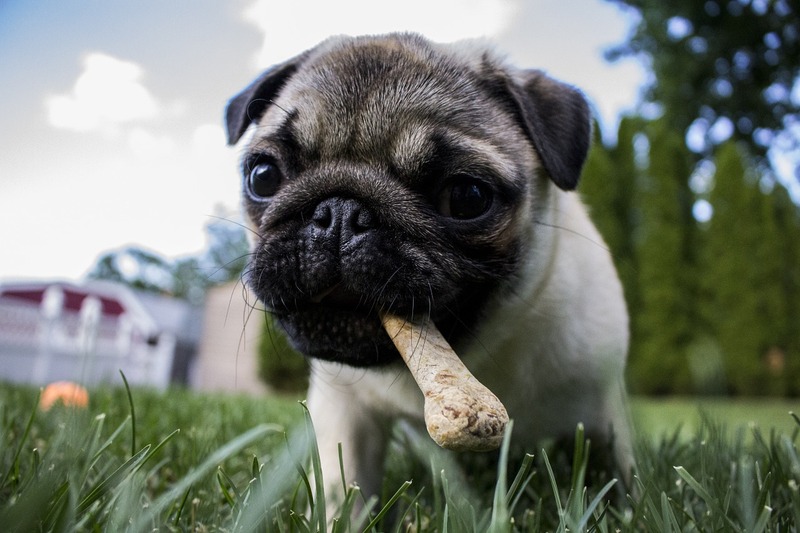 It would be very wrong to allow your dog to continue eating the dog he’s allergic to, and that is why figuring out what it is he’s allergic to should be your primary concern, and the hypoallergenic food can help out a lot in that regard. Food allergies or food intolerance is something that could happen no matter the age of the living being in question. Therefore, you can have a dog reacting to an allergen as a young puppy or as an old dog, there really isn’t any rule. However, every dog owner ought to know that the terms “food allergy” is not equal to the term “food intolerance”, because a food allergy is something that will definitely provoke some kind of a symptom, and these symptoms might include rashes, nausea, itching, diarrhea, etc. This is something caused by an immunological response and is completely different from food intolerance, which is more of a digestive problem that occurs when a dog eats something that does not still well with him. It has nothing to do with the immune system and does not include an immune response. Basically, it happens when a dog just cannot digest something that he has eaten and is associated with vomiting and upset stomach. Most people have experienced it and can be compared to eating something spicy or fried that your stomach just couldn’t tolerate, which ended with you spending the entire night in your bathroom. Many dog owners don’t really know that much about the dog food allergies, let alone which of them are the most common. Dogs can be allergic to a number of foods but some of the most common ones include fish, soy, pork, rabbit, egg, beef, chicken, wheat dairy, etc. However, the most important issue here isn’t really this, but something else – the fact that most dogs are allergic to more than one thing! And unless you take your dog to a vet, it’s really going to be hard to see what that is. You will probably start noticing the symptoms of allergy, but you won’t be able to determine what it is your dog is allergic to. Most of the allergic reactions are associated with some kind of a protein source, and this protein source is typically meat that can be found in the food that your dog eats. It is going to be tough to find out what it is that is proving to be this terrible for your dog, or more precisely, what are the food ingredients that your dog finds allergenic. However, don’t think that the hard work and effort you put into this won’t be beneficial for your dog, because this investigation will ultimately lead to the root of all problems. It may take several months for you to discover what it is that causes these symptoms, but eventually, it will all be worth it. Keep in mind that it is your dog that is suffering the most throughout this ordeal, and has to live with the allergy symptoms. As we have already mentioned, finding out the root of these problems would take some time, and it could even take months, and in some cases, years. This happens mostly because of the fact that the allergic reaction does not start occurring immediately after your dog ingests something that his immune system just doesn’t know how to work with. It can be really difficult to make a specific diagnosis of food allergies, and the biggest problems with this is the fact that most of the allergy symptoms are pretty much the same – they mostly include skin rashes and an upset stomach. 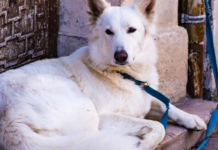 Other symptoms that are going to indicate to you that your dog is indeed suffering from an allergy include itching and gastrointestinal distress. However, the symptoms are not limited to these, because additional ones include diarrhea, gasses, vomiting, red inflamed skin, itchiness, stunted growth and sneezing. However, it ought to be said that these aren’t the symptoms of allergies, but can also be the symptoms of various other diseases, which makes the diagnosing of an allergy even more difficult. This is exactly why it is extremely important to get your dog to the vet for frequent checks – this can at least help eliminate some terrible diseases and conditions and lead to the conclusion that it is the allergies that your dog is suffering from. Only now can the process of diagnosing the food that is causing these symptoms to begin, because only now do you know that it is an allergy that is tormenting your dog. The first thing you’re going to have to do is having your dog start a food trial that usually lasts from eight to twelve weeks. During that time, your dog will eat nothing other than a simple elimination diet, as well as, of course, water. This means that your dog is not going to get any special treats, junk food or any flavorings. It would be best to let your veterinarian explain to you what exactly the food trial is and what’s involved in it. He’ll also need to tell you what you ought to do in order to keep the elimination diet going and what is it you have to do in order to prepare your dog for it. There are some dog owners out there that have gotten a homemade recipe for an elimination diet, but we believe the best thing to do would be to go out and buy some real elimination diet food – it’s the best and the safest thing to do. Elimination diets are diets that usually consist of carbs, and most of them are sweet potatoes and rice. These two foods are being used because they are extremely rarely allergic. 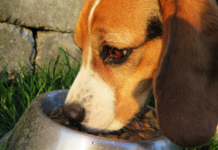 Now, doing this may sound and look easy, but believe us, feeding your dog elimination diet can be pretty difficult. In order to do it, you need to make sure that no one else is giving any other food to your dog and especially any meat or treats! If such a thing would happen during the elimination diet, it would all be in waste! Some folks find that overwhelming, and that is why it is always smart to talk to your vet and ask for a simple patch test that is going to help you determine which are the foods that your dog is definitely not allergic to. But, it should be said that this test is something that should be taken with a grain of salt, and the food test is the best one for figuring out which are the foods that your dog is allergic to. You can watch this video that offers a lot of useful information about what to do and how to control the allergies of your dog. As we have already mentioned, the dog food that you ought to start administering to your dog needs to come in one of the three above mentioned categories: limited ingredient, novel ingredient, or prescription diets. It is always the wisest to stick to one of the first two categories, which means that you ought to give your dog either the limited or the novel ingredient dog food. The prescription diets can really be expensive, and that is the main reason why we believe that you shouldn’t start with this category. However, if your dog develops a really serious case of allergies, you will probably have to start giving him the prescription diet in order to help him out. And in order to help you figure out which of the hypoallergenic foods are the best, we’ve decided to give you a list of the top five ones. 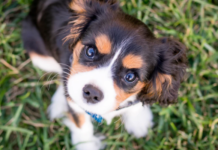 The research that has gotten into this list is extensive, and thousands and thousands of dog owners’ reviews were read in order to compile it. Now, keep in mind that there are some foods that people think are hypoallergenic, but in fact are not, such as some grain-free pup food. This is because there usually is some protein in these foods, and the dogs can be allergic to these proteins. 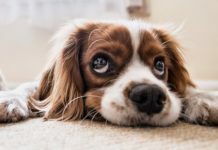 In theory, this food should start offering results immediately, and as soon as you remove all the foods that your dog is allergic to from his diet, the symptoms ought to start diminishing. That is why you ought to start administering hypoallergenic food to your dog as soon as possible. 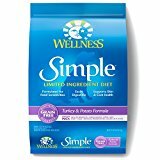 Wellness Simple Limited Ingredient Dog Food is a dogs’ food that comes in many various options, and they include turkey, duck, lamb, etc. What’s great about this food is the fact that it contains many safe ingredients that are completely healthy, and that your dog is more than likely be able to tolerate. However, in order to be sure of this, you should really double check it. Just one formula of this amazing product has hundreds and hundreds of reviews online left by the dog owners that have tried it out. And what’s really important here is the fact that these reviews were overwhelmingly positive, which basically tells us that the dog owners are saying that it works and gives results. It should be said once again that this is a limited ingredient food, which is one of the three main categories of the hypoallergenic foods for dogs. 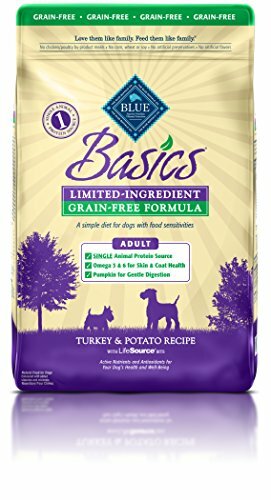 Also, this food is also great and can be used on pit bulls because it is believed to be the best dog food for pitbulls with allergies. This dog food possesses all the ingredients that help us discover what is it that is making our dog so uncomfortable quite easy due to the fact that it has only one source of protein, does not contain any additives or extra filters, and possesses an easily digestible carbohydrate. Another thing that makes this food amazing is the fact that it is completely gluten-free and has no meat by-products, nor any artificial colors, flavors or food preservatives. It is completely natural and safe. Why We Like It – This is a product that comes to us in many different options, which include duck, lamb, turkey, etc. It has a great number of healthy ingredients which are healthy and safe, and that your dog would be able to tolerate. 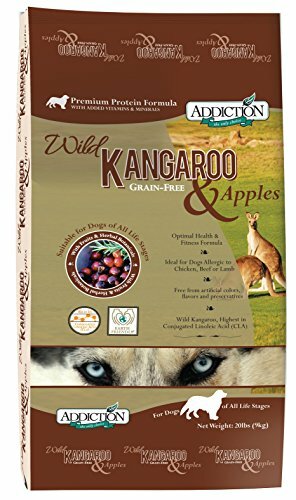 Addiction Wild Kangaroo and Apple is also an ingredient food type of hypoallergenic foods, and we’ve already said a word or two about those. The reason why this product falls in this category is the fact that its main protein ingredient is the kangaroo! It is at the same time holistic, gluten-free and a hypoallergenic product. 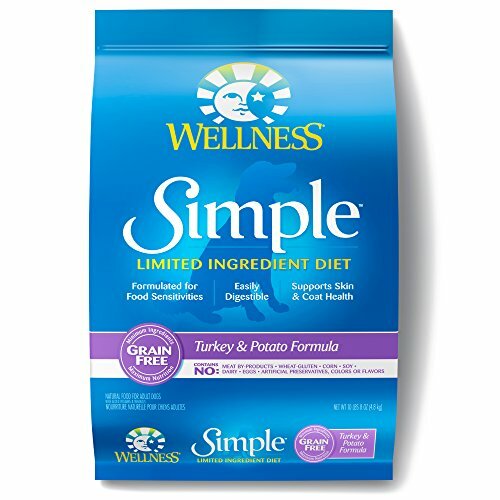 This dog food is completely healthy, and in no way contains any hormones or unhealthy antibiotics. 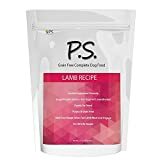 This product also goes so far as to contain antioxidants as well as flavonoids in order to boost up your dog’s immune system, which says a lot about the product. In order to compile this list, we had to conduct research, and during that process, we realized that this product is actually one of the most recommended ones when it comes to dog foods meant to be used by the dogs suffering from allergies. This is a big thing, and the fact that the consumers have told this to us means a lot! Also, many dog owners say that their big dogs such as Huskies just love the taste of this food, which is exactly why you ought to give it a try. It can’t hurt. Did you notice those lovely piercing husky eyes on the packaging? Why We Like It – This is a novel ingredient type of dog food because the kangaroo is the main protein source here. There are no hormones or unhealthy antibiotics here, and the product even includes flavonoids and antioxidants in order to boost the dog’s immune system. 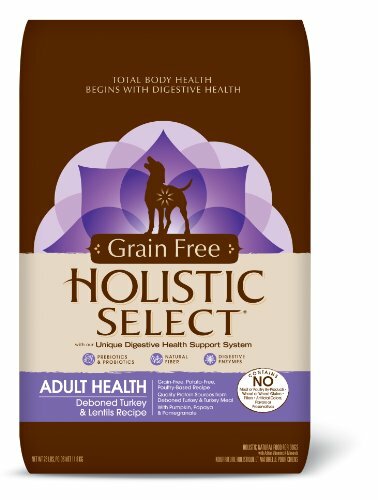 Holistic Select Natural Dry Dog Food is a product that has also found its way on this list of the 5 top hypoallergenic dog foods, and this occurred mostly because of the fact that the reviews that this product has gotten from the dog owners who have tried it was almost entirely positive. This company is not that big of a name when it comes to this field of industry, but the fact that many dog owners have switched to this one from some other brands tells us a lot about how good it is. This company has spent quite a lot of time researching this product and developing it, and we can see all of that on one small item that this product has – a digestive health support matrix. It is an item that contains prebiotics, probiotics, natural fibers, digestive enzymes, as well as certain plant botanicals. 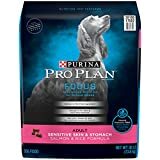 This is a great product both for the dogs suffering from terrible allergies, but also for the dogs that are experiencing any other problem with their digestive help. Basically, it is multifunctional. Holistic Select is a company that tries so hard and manages to give us products that only contain the best possible ingredients that have absolutely no meat by-products, artificial flavors, wheat or fillers. Such is this product. Why We Like It – Holistic Select Natural dog food is a dog food with overwhelmingly positive consumer reviews, and the popularity of the product stems from extensive research and development of this dog food. It also offers support for the dog’s digestive system in the form of ingredients such as prebiotics, probiotics, natural fibers, plant botanicals and digestive enzymes. 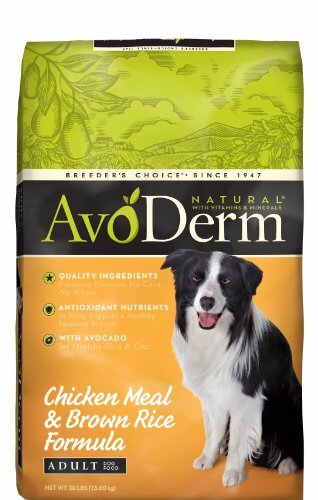 AvoDerm adult chicken meal and brown rice formula is great food for dogs that are both tasty and has the ability to give optimum nutrition to your pet. It is a product that can give your dog nutrition that is both healthy and balanced, which is something your pet desperately needs if you want it to be a healthy dog and to live a full and happy life. What is great about this food is the fact that it contains no corn, wheat or artificial flavors whatsoever. All the ingredients that can be found there are pure and top-quality, and they include antioxidant nutrients, as well as some avocado! All this makes it easy for your dog to eat it, and what’s even better is the fact that it goes easy on your pet’s stomach. This is a dog food that has a rather rich concentration of fats which come in the highest possible quality. And that’s not all, because it also contains oils that have a balanced ratio of Omega-6 to Omega-3 fatty acids. You might also want to consider this food when feeding your Yorkshire Terrier. Why We Like It – This is a product without any corn, wheat or any artificial flavors, and only contains pure high-quality ingredients some avocado and the antioxidant nutrients. It won’t be hard for your dog’s stomach, and is rich in high-quality fats and a balanced Omega-6 to Omega-3 ratio. Blue Buffalo Limited Ingredient Dry Adult Dog Food is a product that is great for both the dogs suffering from some kind of an allergy and the dogs that suffer from food intolerances due to the fact that it is a limited-ingredient product that has a grain-free formula. This company makes products that offer a well-balanced diet for all the dogs that are extremely sensitive to food. They do so by only putting the high-quality proteins in their products that contain novel ingredients as well as some rather tasty and easily digestible carbohydrates. 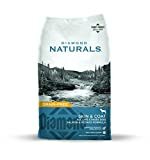 This is not the only type of dog food that this company produces; they produce many other which can complete the health of your dog and prolong your pet’s life. Why We Like It – Blue Buffalo Basics offers balanced diets for all the dogs with sensitive stomachs. It does so by containing quality proteins with novel ingredients, as well as carbohydrates which can easily be digested. Great post. Really looking forward to read more. Cool.